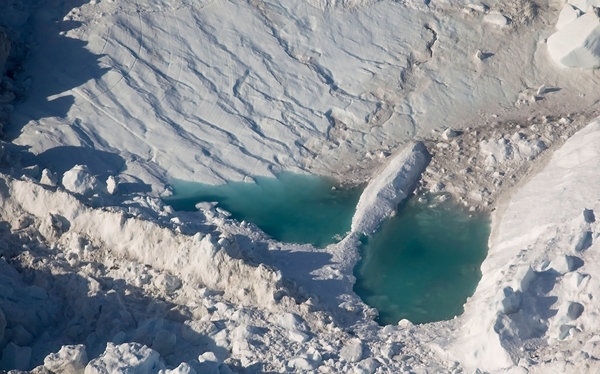 Pools of water form as ice melts atop Jakobshavn Glacier in Greenland.| From an article in Rolling Stone Magazine | Click on the picture to read the full textEverywhere you look there's a story about climate change, from fires to droughts to glaciers melting and sea-levels rising. This is my response to an issue that feels overwhelming. It's an admittedly nutty and miniscule, arty drop in a very serious, very big ecological, economic, sociological and political bucket. This project is also a lot of 'firsts' for me as an artist: A political, conceptual, sculptural installation involving considerable technical, logistical and scientific challenges. Scary? Yes. Making art and showing is frightening. You expose your innermost thoughts and emotions. What if your Jello doesn't set or melts right away for instance. This is vulnerability everyone but it's part of the job. In all seriousness I feel passionately about water and I'm deeply concerned where it's going to come from in the future worldwide and how we are going to have enough of it to grow food for us all. What's truly frightening to me is the thought of waking up one day in the US to find we've sucked the last sip out of the Oglalla Aquifer, one of the major sources of water for crop irrigation. I don't know about you but 2,000 gallons of water to raise one pound of beef seems like a crazy equation and a bad deal. The concept of my project is simple. Jello is made from cows. Smoke Farm where the Lo-Fi Festival is held was a dairy farm. The Jello will sit in the dirt next to a stream where cows used to walk. Hopefully it will be be fun to look at. But if anyone cares to think about it enough to seek out a grassfed burger, or refrain from eating that cheeseburger one extra day a week that would be extra fantastic. If you do happen to be out at Smoke Farm this Saturday, whatever you're having for lunch (and there will be a lot of tasty meat grilling going on) if you want some dessert stop by my installation, I'll have lots. The color is a surprise and the presentation is a little unusual but as my grandma used to say a speck of dirt never hurt anyone.